← Another piece of the jigsaw is back. I have a black dog, a darkness that will not shift regardless of circumstances. It comes and goes, sometimes circling hungrily, sometimes shy and hiding in the background, sometimes as far from the horizon as the eye can see. When it goes I think this might be the time it stays away for good, when it comes back I think it will grow bigger and bigger until it consumes me. The black dog had been away for a while, I presume pregnancy, breastfeeding and the swirl of hormones raging have played their part in its absence. I grew used to it not being there, to the familiar weariness of sleep depravation rather than the black paint brush tarring everything I look at. Even the crazy days of the first few months of sonface’s life felt like a different kind of darkness, the darkness of everything changing and of major identity shifts. In the last few weeks the black dog has been lurking again, so unused to it’s presence I almost didn’t recognise it. I thought that everything was broken, hopeless and empty. I forgot that’s the work of the black dog, to paint everything grey: the past, the present and the future. Every thought I had turned bitter in my mouth. Every thought of the future filled with unimaginable fear as to how everything would work out. Every relationship felt broken and filled with insecurity. That’s how the black dog works. Everything tainted, everything spoiled, everything a disaster. The black dog can be tricky at times, sometimes it’s really obvious, so obvious that I laugh and it shrinks small and quiet. Sometimes though it’s clever, sometimes it manages to convince me that I have made it up, deceived myself, caught in a spiral of make believe. I think that everything really has gone dark and there is no cause, just lots of lies I have made up about my world. In such times I have to spin around really fast to catch it’s tail as it races away. A few mornings ago I managed to catch a glimpse in the gloom. The black dog has a weakness, mine, at least, can’t cope with immediate physical experiences, things that have no meaning attached to them, things that can’t be overanalysed, that can’t be reduced to bleak. I sat in my living room and a breeze swirled around me. A simple breeze that had no past or future. It stroked my skin and I felt alive again. Simple presence brought me tumbling into the now and I saw the dog scuttle away into a corner. Light burst in and I could see that everything wasn’t really black, just in shadow. Colour appeared briefly in my world and I began to feel free again. I’m increasingly annoyed that this black dog appears in every circumstance, that the wonder of hanging out with my son each day, seeing him grow and develop could be reduced to grey darkness. I’m annoyed that I can’t see the colour, the joy, the good in my world in such times. I hate the despair, the gloom, the lack of hope. I’m weary of the vacant staring at walls or at my son when we are on our own. I’m glad there is light, that the black dog is just a black dog, the one who makes everything seem sad. I’m glad that really not everything is sad. I’m glad there is hope and that this world goes deeper than the gloom, that we have a light that the darkness just doesn’t know what to do with. I’m glad that right now I can see colour and light again. I’m glad that there has been space to doubt the despair and seek some truth. I’m glad that someone holds onto me in these dark times when nothing seems real or true. I’m glad that Jesus says he is praying for me when I cannot string two words together to call for help. I am glad that one day everything sad will come untrue and I will sparkle like a jewel. This has been the verse I’ve read each day this week: “The Lord their God will save his people on that day as a shepherd saves his flock. They will sparkle in his land like jewels in a crown. This vision of the future has kept me sane. 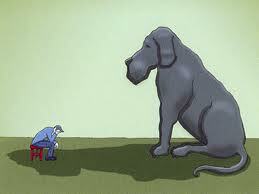 One day the black dog really will be gone forever. This entry was posted in Life on the journey and tagged black dog, darkness, depression, hope, Jesus, Light. Bookmark the permalink. Hey lovely, thanks for your message – and the love it contains. I did wonder at one point about postnatal depression but I don’t think I had it – we looked at the symptoms and I didn’t have many of them. I’m fairly sure the depression i felt recently is just the one that’s been lurking on and off since teenage days – it’s so familiar! I’ve actually been feeling lots better since being pregnant and with Ethan – the haze of sleep deprevation and the mentalness of the first three months aside! I think there is so much to adjust to being a new mum and its so flipping hard but I think from what I’ve read post natal depression is a whole deeper thing. Love your honesty and concern! Wish we could sit down and have a good old chat! You describe it so perfectly, always. Lady – you wanna write a book on depression? I would buy it.